The reverse of the bunting is silver with a sparkle finish. Banner can be used as one complete length or separated to provide 3 sections. Great for party decorations with the use of tape or blu-tack, Can also attach it. Ideal to hang from walls, ceilings, windows etc. A great decoration for any party or event. 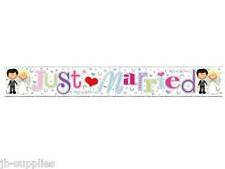 9ft / 2.7m Long Extra Wide Girl's Christening Pink & Silver Holographic Foil Banner. A great extra wide pink & silver holographic foil banner for a girl's Christening celebration or party. This pretty pink & silver coloured foil banner reads :Christening Celebration. 10 Ft /3M Length. A very effective party decoration. Featuring 2 contrasting pennant designs which are alternated along the lenth of the bunting Silver foil pennants featuring a central number 40 in black & white surrounded by smaller white 40's & black & white stars with a black heading decorated with silver & white stars. The reverse of the bunting is silver with a sparkle finish. Suitable for male & female. The brightly coloured foil banner reads :Happy 50th surrounded by stars & flowers. Greater impact is given by the banner being extra wide. Featuring 2 contrasting pennant designs which are alternated along the lenth of the bunting Silver foil pennants featuring a central number 80 in black & white surrounded by smaller white 80's & black & white stars with a black heading decorated with silver & white stars. Give your party that finishing touch! Color/design may be different from the picture. All these pictures are for illustration purpose. Specification, color and content may vary from illustration. Silver Background. Note: Due to the different monitors, the pictures may not reflect the actual color of the item. 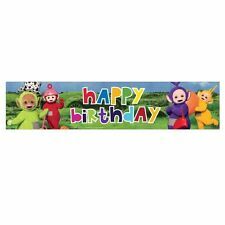 Pretty Blue Baby Shower Foil Banner Party Decoration - 12ft / 3.6m Long. A pretty blue foil Baby Shower banner for your celebrations. The foil banner reads: Baby Shower. Ideal for parties & perfect for a boy's Baby Shower celebration. Pink Holographic Hen Party Pennant Flag Banner / Bunting Party Decoration - 12.8ft Long. The reverse of the bunting is silver with a sparkle finish. A 12.8ft length of 11 triangular pennant foil flags in a brightly coloured pink & silver stars design for a Hen Party celebration. Greater impact is given by the banner being extra wide. Ideal for parties - make an impact with this decoration! Garland length is approx: 9ft / 2.7m. The beauty of the garland being wired is that it can be shaped & wound around whatever you want to decorate. A great decoration which is suitable for all occasions. The reverse of the bunting is plain silver. Girl's Cute Christening Foil Pennant Flag Bunting Party Decoration - 13ft Long. A 13ft length of 11 triangular pennant flags bunting for a little girl's Christening celebration. The bunting consists of 11 pennants in 4 assorted designs along the length. Pink Radiant Cross Foil Communion Celebration Banner Party Decoration - 12ft / 3.6m Long. The silver foil banner reads: Communion Celebration in pink with an elegant pink scroll border & is decorated with images of a chalice & host. 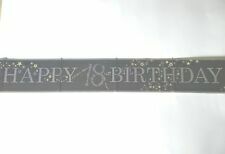 9ft / 2.7m Long Extra Wide Girl's Confirmation Holographic Foil Banner. A great extra wide holographic foil banner for a girl's Confirmation celebration or party. This pretty pink coloured foil banner reads :Confirmation with an image of a white dove. 9ft / 2.7m Long Extra Wide Boy's Christening Blue & Silver Holographic Foil Banner. A great extra wide blue & silver holographic foil banner for a boy's Christening celebration or party. This lovely blue & silver coloured foil banner reads :Christening Celebration. Pink Holographic Baby Shower Pennant Flag Banner / Bunting Party Decoration - 12.8ft Long. The reverse of the bunting is silver with a sparkle finish. A 12.8ft length of 11 triangular pennant foil flags in a pretty pink design for a Baby Shower celebration. Blue Holographic Baby Shower Pennant Flag Banner / Bunting Party Decoration - 12.8ft Long. The reverse of the bunting is silver with a sparkle finish. A 12.8ft length of 11 triangular pennant foil flags in a bright blue design for a Baby Shower celebration. The reverse of the bunting is silver with a sparkle finish. Each flag has a holographic bubble design in shades of blues with white & silver giving a glittered effect surrounding t he wording 30th. A 13 ft length of 10 triangular pennant flags in the new Blue Sparkle design. A great extra wide holographic foil banner for a 50th Golden Wedding Anniversary celebration or party. This lovely silver foil banner reads :Golden Wedding Anniversary with images of tiny stars & hearts & a white heart with 50th within it. Pretty Baby Shower Holographic Pennant Flag Banner / Bunting - 12ft Long. The reverse of the bunting is silver with a sparkle finish. A 12 ft length of 11 triangular pennant flags in a pretty multi-coloured design for a Baby Shower celebration. Greater impact is given by the banner being extra wide. The reverse of the bunting is silver with a sparkle finish. Each flag has a holographic bubble design in shades of pinks with white & silver giving a glittered effect surrounding t he wording 30th. A 13 ft length of 10 triangular pennant flags in the new Pink Sparkle design.